It’s that time of year! Here’s our tutoring and elective credit class schedule for 2016-17. Let’s have a great year! Certified teachers are available on Monday and Wednesday afternoons between 2 and 5:30 p.m. for help with math, English, and many other subject areas. Contact your YAN (cell phone) or the D2 Center (402-502-8534) if you plan to attend no later than 11 a.m. on Monday or Wednesday and let us know what time you plan to arrive. 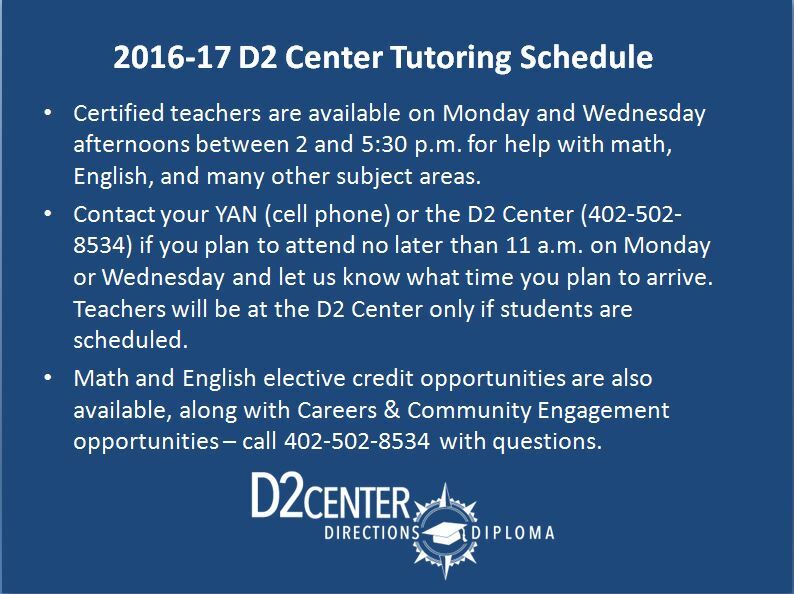 Teachers will be at the D2 Center only if students are scheduled. Math Elective: Students master the fundamentals and beyond by using Khan Academy (online) in a math computer lab setting; a diagnostic test at the beginning of the course allows teachers to differentiate instruction, build on individual math skills, and provide 1:1 assistance. 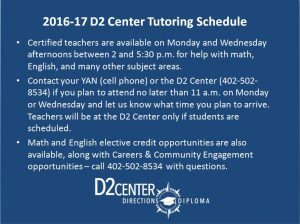 Students need to call D2 Center Director Greg Emmel (402-502-8534) to enroll in either course. Teachers are available on Mondays and Wednesdays from 2 to 5:30 p.m.
Elective credit or other career assistance is available on an “as needed” basis. Contact your YAN (cell phone) or Career Navigator Jerrie Glassman (402-917-0077). Students utilize a variety of resources to explore and select career options, identify educational and training pathways, create a resume, and develop soft skills needed to be successful in a career. Students also explore career experiences in the community. The Career Navigator is available to assist any D2 Center student or graduate with career exploration, postsecondary planning and engagement, resume writing, job searches and applications, mock interviews, and other job or career-related skills and strategies. *Classes/Tutoring start on Wednesday, September 7 and continue through the end of the school year. Classes are for elective credit and require a minimum of 45 hours of class time and the successful completion of all assignments and tests.